This is a review of the Foot Spray manufactured by Nordic Care. 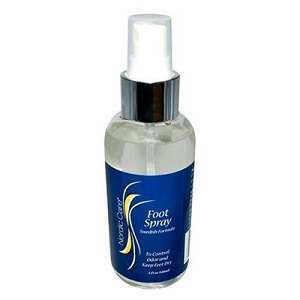 The Foot Spray is said to follow a Swedish recipe to keep your feet dry and to control odor. Read on to learn if this product is right for you and your symptoms. Denatured alcohol is usually used in cosmetic projects like astringents and solvents. Aluminum is a popular additive to many antiperspirants. Zinc phenolsulfonate is a common product in deodorants, body powders and aftershaves. It is said to prevent the growth of micro-organisms. Diethyl phthalate is a toxic chemical that is used to make plastics more flexible. It is suggested that you spray this product on your feet after you take a shower or before you exercise in order to keep your feet dry and prevent odor. If you are pregnant or breastfeeding, consult your doctor before using this product. This product is designed for external use only and should be kept away from the eyes, nose and mouth. Many of the ingredients listed in this product are chemicals that are used as fillers in cosmetics. While they are not dangerous in small doses, they are toxic when ingested. Many companies are moving away from using aluminium. There are no official side effects listed when these chemicals are used in topical products. However, if you are trying to avoid products with ethanol and aluminium, you will want to avoid this product. This product also includes parfum. If you have sensitive skin, consult your doctor before using this product. Retailers have set the price for this product at $7.17 for a 4 fl oz bottle of Foot Spray. This is discounted from $9.95. If you buy it in bulk, you will receive a discount of 10%-15%. The retailer does not list a guarantee for this product. Nordic Care, the manufacturer, lists a 100% satisfaction guarantee. However, they do not list this product on their online store. The retailer’s website provides only three reviews for this product, two of which are positive. Since the product is not listed on the manufacturer’s website, there are no reviews available there. This product is relatively inexpensive and the manufacturer does offer a guarantee on its products, although it does not list the Foot Spray on its website. While this product contains many of the normal ingredients for an antiperspirant, it is not clear how the product would help treat athlete’s foot or other fungal infections that may contribute to uncomfortable rashes and foot odor. There is also not a full list of ingredients available so if there is an active ingredient that would make this product work, it is not clear what that ingredient is. Jimmy Rodriguez	reviewed Nordic Care Foot Spray	on June 11th	 and gave it a rating of 2.5.